I have been playing with data binding more and more over the last couple of weeks. This week, it’s all about creating a dialog with stuff dictated by a value from an enum. I have added a new button in my Sandbox app to choose one value from the enum and display the properties in an alert dialog via data binding. Ambitious, I know! 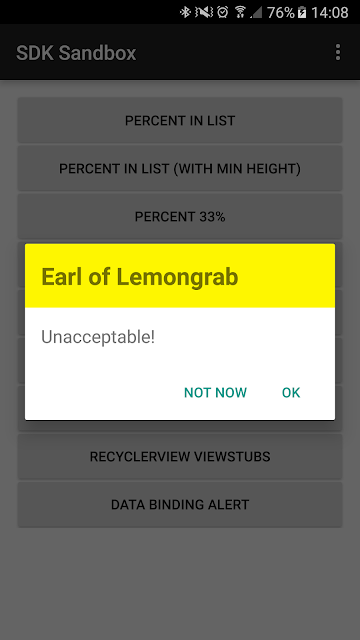 So how do we make the Earl of Lemongrab happy? There are two ways of solving this problem. A BindingAdapter lets you manipulate and do a bit more involved logic on your data before applying it to the View. To use a BindingAdapter, first create a static method in your code that is bound to either a standard Android attribute or a custom one. Do not forget to add the app namespace! Android Studio can add this for you. Just type in appNs and it will autocomplete. This solution works, but is a bit too involved. And you said data binding is easy!!! But it didn’t work! Well it turns out the problem is because we are passing a resource ID into an attribute that expects a resolved color value. So the only thing we need to do is to move all that code in our BindingAdapter into XML. Very convenient! And it works! Note that you do not have to import anything to use context, there is some data binding magic going on that automatically injects it for you if you call it. Think of it as The Beckoning of the Context. The Earl is now happy.